Gabriele Münter was one of the few women who played a part in the development of German Expressionism. As student, collaborator and partner of Wassily Kandinsky during the years leading up to the First World War, she was actively involved in various Munich art movements such as Der Blaue Reiter (The Blue Rider). She trained at the Malschule für Damen, the Düsseldorf drawing school for women, in 1897 and later, in 1901, at the Phalanx school, where she was taught by Kandinsky.With him she visited Tunisia, Belgium, Italy and Austria, returning to Berlin in 1908 and settling at last in Munich. 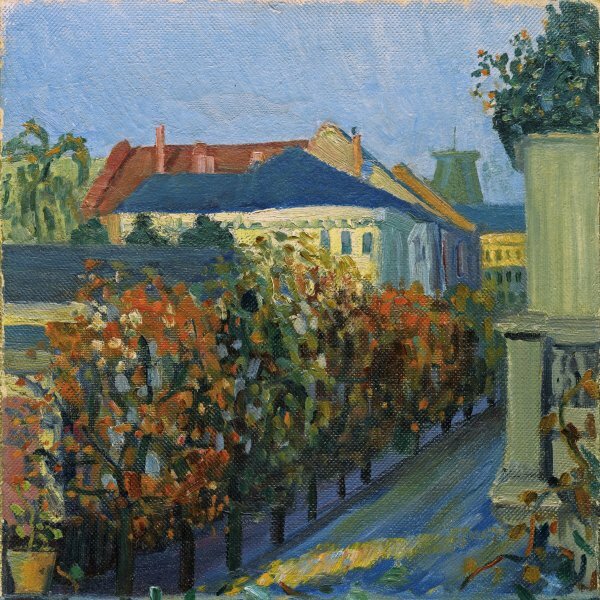 In 1909 she bought a house in the Bavarian town of Murnau, where Kandinsky, Alexej von Jawlensky and Marianne Werefkin met during the following summers. At Murnau Münter’s art evolved towards a simplification of form, influenced by the experiments of her colleagues and the discovery of the typical paintings on glass from this part of Bavaria. After taking part in the exhibitions of the Neue Künstlervereinigung in Munich in 1909 and 1910, Münter left the association together with Kandinsky and Franz Marc to participate in the exhibitions of Der Blaue Reiter and create its almanac. In 1914, when the First World War broke out, she moved to Switzerland with Kandinsky and later to Copenhagen on her own. Her relationship with Kandinsky ended soon afterwards. After the war Münter returned to Murnau, where she lived from then onwards. In 1927 she met the philosopher and art historian Johannes Eichner. She and Eichner remained together until he died. The resurgence of interest in German Expressionism following the Second World War led the importance of this artist to begin to be recognised.